Besides working on furniture and dreaming up beautiful decorating solutions for empty spaces, I really love learning about and discussing the broader subjects of who we are and what we are here to do on this planet (individually and collectively). I was just watching a rerun of Oprah’s Super Soul Sunday (http://www.oprah.com/app/super-soul-sunday.html) online, where the discussion was revolving around finding what makes us happy and spending more time doing it. So, I wanted to spend some time additional time expanding on why I started this blog and why I am taking this leap of faith sharing what matters to me and makes me tick. Over the last ten years since I graduated from college, I have been struggling to find my place in the world. Until the last few years, I have been making choices and building a life in some regards based on pure survival, not joy or happiness. For many years I have been one those people who was always looking towards the next better thing in life – – “oh, if I get this job, then I will be happy,” or “if I have this degree, than I will be able to get that other job, and then I will be happy”…or “if I move here than I will have more space and will be able to do this, this, and that, THEN, I will be happy.” I think it all came to a head after I had my wonderful son and I realized, I still wasn’t fully content nor did I feel like I had found my true purpose in this life. This was hard to admit to myself, let alone my family and friends because in many ways I felt like a failure and like somehow this meant I didn’t love my son how I was supposed to. But, for me, it has been so amazing positive, because essentially my son was the catalyst for me to look within and figure out what I wanted out of life. And to answer the question of WHO AM I REALLY?!? Well, I have been on this official journey for 165 days (I have been keeping track in my journal…J) and am making progress. SO – l hope you will indulge me as I will continue to share my furniture journey, but will also share my personal one, including what I learn and all my ups & downs. This is the first leap I am taking; really, to follow what makes ME happy. Since, I am not currently spending my days doing what brings me joy, nor am not exactly sure what that is yet, I am acting as if… I am having an attitude of joy, love, and gratitude and am trying to live in that space every moment. Keyword is TRYING – it can be very challenging at times! Thanks for reading!! More to come. Thank you for your open and honest journal of your experiences. It is inspirational and joyful. 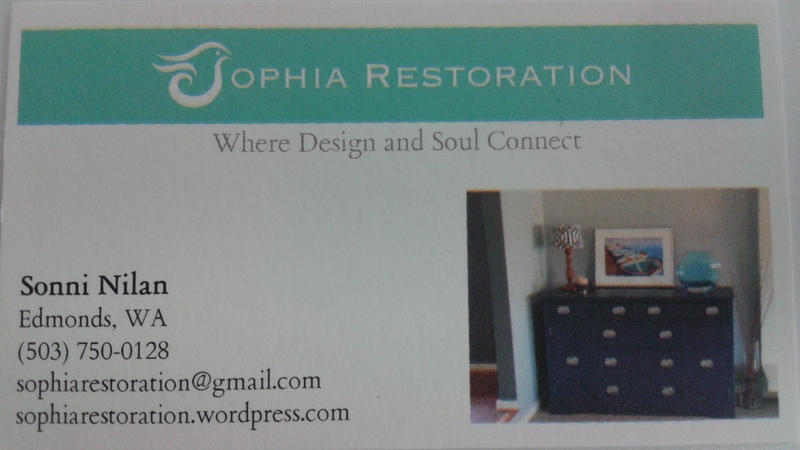 Loving your furniture and life journey.